I lived near Hurlburt Field for four years while in the military, so I know the housing market fairly well. I’m going to break down the neighborhoods where most military live, providing pros and cons for each. Navarre is located west of Hurlburt Field towards Pensacola. It consists of neighborhoods and beaches along Highway 98. This is the most popular area to live near Hurlburt Field, as you get the biggest home for your money. Your commute will be anywhere from 5-30 minutes depending how far you go from the base. There are many family-friendly neighborhoods along Highway 98 leading to Navarre. Most feature large homes with decent size yards. Holley by the Sea, a subdivision near Navarre, features 4,700 homes, all with access to a recreation center and swimming pools. Most homes in this area will be a short drive to the Navarre bridge, which takes you to Navarre Beach. This is a beautiful beach that’s less crowded than the beaches in Destin. 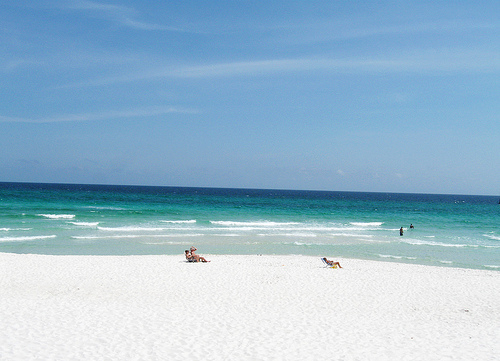 It really depends what you’re into though… the crowds in Destin can also make the beach fun. Beware, traffic along Highway 98 is rough. A lot of accidents happen on that road due to cars darting across the highway at one of the many intersections. I’m a victim myself, totaling my Honda Accord in 2004 after I crossed the bridge into Destin. You can expect to be stuck in traffic probably once a week for more than 30 minutes due to an accident. The neighborhoods in Mary Esther (area right around the base) and Fort Walton Beach are close to base. Some of the nicest neighborhoods can be accessed by driving out of the back gate. These homes are very convenient as you avoid many of the headaches associated with Highway 98. 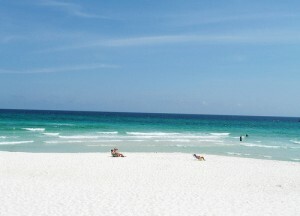 The majority of the homes on Okaloosa Island are condos. Live here if you want to be on the beach but fairly close to Hurlburt Field. I lived in Destin for my first year while at Hurlburt Field. Destin is a clean, upscale, town. This is your best option for access to great beaches, bars, and nightlife. Your commute to Hurlburt will be at least 15 minutes and more likely 20+. The traffic in Destin gets really bad during the summer months. You’ll be right in the middle of the party all summer long, but it will tick you off on a few days when you just want to get home and relax. Emerald Coast Homes Online – this is a joint web site shared by all of the realtors. Probably your best bet for finding a home near Hurlburt Field or Eglin AFB.